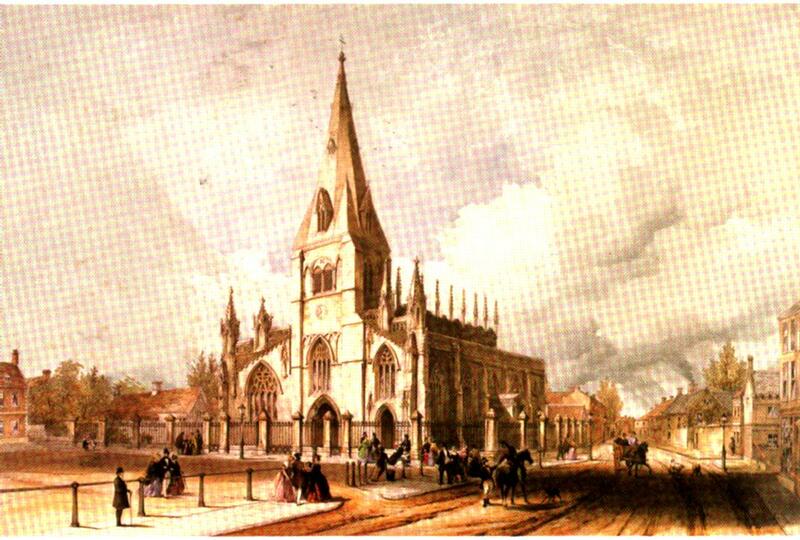 Prominent in the centre of Sleaford is the Parish Church which is dedicated to the French Patron Saint, St. Denys. It represents three quite distinct architectural periods the 12th/13th century tower; the nave and aisles of the Decorated period; and the chancel and nave clerestory of the Perpendicular period. The Church, built of Ancaster stone is distinguished by the broach spire which, surmounting the west tower, soars to 144 feet. Although reconstructed in 1884 it is, in fact one of the earliest broach spires in England. On either side of the tower and below the spire is the highly decorative west front which is unusual for a church in a town of this small size. Here is rich 14th century carving with crocketed arches, carved spandrels and turrets and tabernacles. The Church interior is very uniform with the same general design varied only in detail not a normal feature in a town church that has developed over the years. At the chancel entrance is found a fine medieval rood screen which retains its original platform and pulpitum. The rood itself was restored in 1918 by Sir Ninian Comper but the upper parts are original. Other features include the very fine communion rail which came from Lincoln Cathedral; a 17th century doel cupboard; a desk with several early chained books; a small piece of an early 17th century tapestry; and a dorsal that is also of the same period. There is much stained glass including a window by Kempe, and another in the south aisle, by the Morris Company, a beautiful light of floral and leaf design. The Vicarage, which stands on the north side of the churchyard, is one of the oldest surviving houses in the town. The main wing with timber framed gable is 15th century, although the chimney piece within is dated 1568. The red brick wing was added by Charles Kirk (of Kirk and Parry) in 1861. Trollope, writing in the 1870s, drew a distinction between this Vicarage (which he thought had been the home of one of the chantry priests of the church) and the Parsonage of Sleaford, sold off in 1797 and later demolished. This stood to the east of the church (near the Waggon and Horses Inn), with a tithe yard and a Parsonage barn between the two. The traveller, John Leland (writing n the 1540s) confirms this arrangement, and a rental (or survey) of Sir Robert Carres property in Sleaford, taken in 1627, indicates a Vicarage between Back Lane (Church Lane) and the churchyard and a Parsonage House, at that time let out for a money rent. It seems likely that the explanation lies in the peculiar ecclesiastical position of Sleaford as a prebend. The Parsonage House was probably the residence of the prebendary, a functionary of Lincoln Cathedral, who actually owned the living and enjoyed the profits of its tithes, but who visited the town so seldom that his residence was normally let out for cash. The Vicarage, in contrast, was the residence of the serving priest. ST. DENYS'S CHURCH, SLEAFORD, LINCOLNSHIRE. 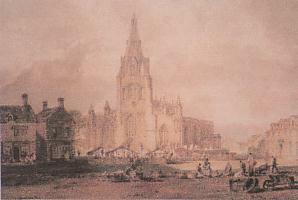 The original pencil and water colour of St. Denys's Church, Sleaford by Joseph Mallord William Turner circa 1798 had been donated as an anonymous gift to the collection of the Rhode Island School of Design's Museum of Art. A member of Sleaford's Civic Trust visited the Rhode Island School of Design's of Art negotiating to produce a 500 limited edition of life size prints to be sold in aid of the Trust. My lithographic print of St. Denys's Church is Number 466 of the limited edition. Born in Covent Garden, London on 23rd April, 1775 Joseph Mallord William Turner, possibly the most successful landscape painter in England in the 1800s, entered his first exhibit at the Royal Academy at the young age of 15 and as a young artist in his early twenties toured Lincolnshire, the second largest county in England, painting many of its landscapes including Sleaford's own parish church St. Deny's, Lincoln Cathedral, Boston Stump and also churches in Louth and Stamford. At the age of 27 Turner was elected as a member of the Royal Academy. Even though Turner was renowned for his oil paintings he was also one of the greatest masters of water colour landscape painting, travelling to many areas of Britain and Europe. Turner became known as "the painter of light" due to his increasing use of brilliant colours in his landscapes and seascapes and many of his drawings, paintings, sketch books and water colours are kept in the collection of the Tate Gallery in London and some of his finest works can also be seen in the National Gallery.